NY Bagel Café franchise advertisements have been dropped from two prominent franchise advertising networks after Unhappy Franchisee provided evidence of deceptive and misleading claims. (UnhappyFranchisee.Com) CoStar Group’s business and franchise advertising networks BizBuySell.Com and BizQuest.Com are to be being lauded for their quick response to a complaint that NY Bagel Café franchise ads on their sites were fraudulent, misleading and possibly in violation of both state and federal franchise laws. The NY Bagel Café & Deli franchise advertisements and associated broker accounts were also in violation of the franchise portals’ terms of service. On April 8, 2015, BizBuySell deleted 20 NY Bagel Café ads and a broker account attributed to a “Vincent Smiff, FoodBrokerInc.” The phone number for Vincent Smiff was actually registered to NY Bagel CEO Joe Smith. BizQuest deleted 9 NY Bagel Café franchise ads and the account of a supposed entity named “Frank Willis Brokerage.” The phone number (888-550-8020) listed for Mr. Willis is the general franchise number of New York Bagel Enterprises, Inc. and Mr. Willis’ P.O. Box (PO Box 4244, New Windsor, New York) is believed to be associated with CEO Joe Smith. The NY Bagel Café franchise ads were positioned under the heading of “established businesses” for sale rather than general franchise opportunity ads. Some of the ads even cited gross sales figures and inventory valuations. However, our research indicates that no NY Bagel Cafe locations exist or ever existed in most of the locations indicated in the 30 ads currently appearing on BizBuySell and BizQuest. NY Bagel Café Ads Violating State Franchise Laws? 4 of the 20 BizBuySell NY Bagel Cafe ads and 3 of the 9 BizQuest ads targeted states where franchise registration is required by law (CA, MD, VA, IL). The regulatory franchise agencies of CA, MD, VA & IL have confirmed that NY Bagel Cafe is not registered in their states and cannot legally advertise its franchise opportunity to their residents. Of the many questionable claims NY Bagel Café makes in its advertising, Unhappy Franchisee is most concerned about the prominent representation that prospective franchisees need only pay the up-front franchise fee (typically $17,500 – $29,500) and the company will provide 100% financing for the remainder of the investment. … all monies required for the build-out, equipment, furniture & fixtures, inventory, lease & security deposits, working capital is “100% financed”. “ONLY CASH REQUIRED $17,500”. EVERYTHING NEEDED TO OPEN YOUR STORE IS 100% FINANCED OVER THE $17,500 FF [Franchise Fee]. Does N.Y. Bagel Cafe’ & Deli provide financing? Of the 34 NY Bagel Café franchises once listed on the company website as open, 30 have closed. Another outrageous advertising claim is that NY Bagel Cafe has “96% brand awareness.” The NY Bagel Cafe chain consists of only 4 local locations in 3 states (NY, NJ, LA) and does minimal local advertising. It seems implausible that this tiny chain has any brand awareness whatsoever. 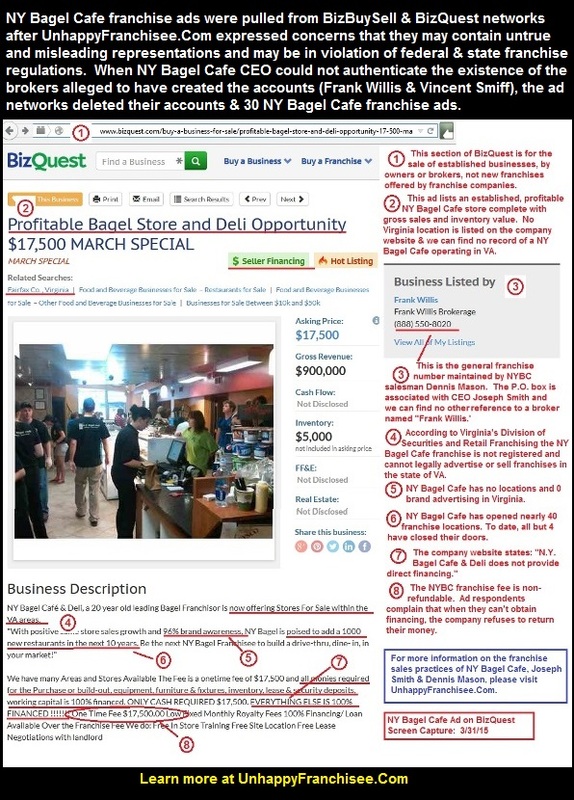 While we are pleased with the speedy investigation and response of BizBuySell and BizQuest in deleting NY Bagel Café franchise ads and its bogus broker accounts, NY Bagel Café, its CEO Joe Smith and franchise salesman Dennis K. Mason are still running questionable ads on Craig’s List and elsewhere. Franchise portals like Franchise Gator, Franchising.Com, FranchiseOpportunities.Com and others are promoting the NY Bagel Café franchise. We ask all of those who are helping to promote NY Bagel Café and other franchise opportunities with disturbingly high failure rates to reconsider. Have you had dealings (good, bad or neutral) with NY Bagel Café, CEO Joe Smith or franchise salesman Dennis Mason, please contact us in confidence at UnhappyFranchisee[at]Gmail.Com or leave a comment below.